We've reached our daily goal, but that doesn't mean we have reached the end. The money will be deposited into an endowment fund and every year the interest will be used as the scholarship payout. The greater the principal, the greater the scholarship payout! Thank you all for the support. 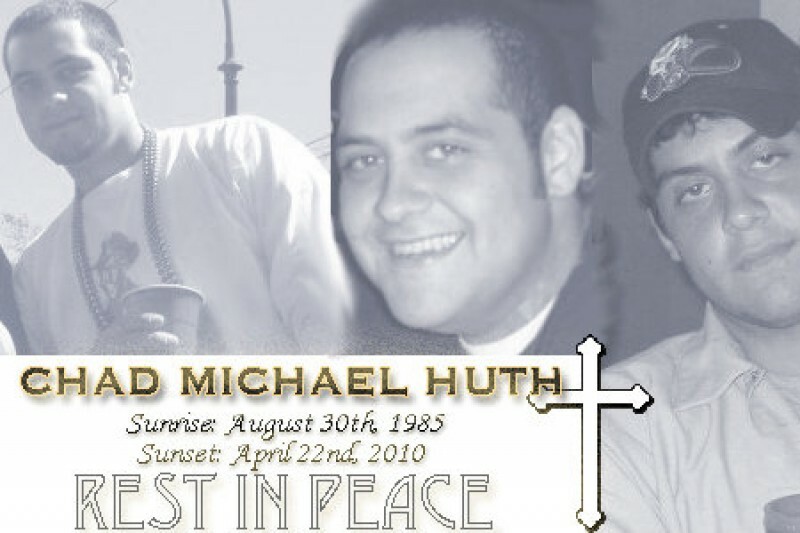 5 years ago today on April 22, 2010, our brother Chad Huth was tragically taken from us. In the wake of his death we put together the Chad Huth '04 Endowment Fund at Chad's Alma Mater: Holy Cross School. We did this for one reason - to never let Chad's name and memory die. Once the fund reaches $25,000.00 it will vest and start contributing to a deserving student's tuition in the form of a partial benefit. 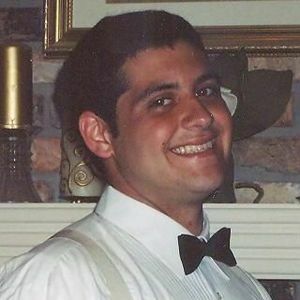 The recipient will go on to graduate from a tremendous school knowing that Chad's memory helped guide him to that day. The following year, a new recipient will be chosen to receive the scholarship. The more money added to the fund over the $25k benchmark, the higher the scholarship payout. On June 12, 2010 we threw a benefit for Chad to celebrate his life and help raise money for our cause. After raising more than $18,000.00 in one night, we gained tremendous ground on our goal; however, we allowed for the dust to settle. We did what we never wanted to do - we let Chad's memory fade. We never forgot him, we still thought of him every day, but quite frankly, we failed to fulfill our mission for Chad. We don't want to accept failure. Over the past years since the benefit, additional donations were sent by family and close friends bringing the total to roughly $21k; however, we still have a lot of work to do in order to activate the fund. If you knew Chad, you knew that he would sacrifice anything for his family and friends. It's time for me to pay back that sacrifice and I am asking for your help. I have kickstarted this campaign with a 10% donation of the remaining money needed to allow the Chad Huth '04 Endowment Fund to begin vesting. Any donation will help us get closer to our primary goal of activating the fund and our ultimate goal of creating a full-year tuition scholarship. If you are not in a position to make a donation, please help us by spreading the word. Thank you all for your support and Rest in Paradise Chad Michael Huth, we love and miss you and will never let your memory fade! I am excited to give you all a little bit of information on Peter Hansen ’16, the first recipient of the Chad Huth Endowment Scholarship. Peter Hansen is a Junior at Holy Cross that currently carries a 4.32 GPA. Peter has been at Holy Cross since 5th grade and has an older brother, Elliott, that graduated last year. Peter’s passion is golf; Dr. Wegmann (Peter's guidance counselor) said that Peter is a strong contender to be a state champion this year and next. Also, Peter will potentially receive a Division I scholarship for golf. Peter is an outstanding student that gets along socially with his fellow students. He is about to begin peer tutoring for middle schoolers that need help in particular subjects. This year Peter was selected by Holy Cross since criteria for Chad's scholarship was not set up in time; however, I feel that HC did a great job and Peter is a very deserving student. In the future, we will be able to set up criteria for who receives the scholarship, whether it be financial hardship, involvement in extra curricular activities, community stewardship, etc. Thank you to everyone who continues to donate to the cause - it is truly remarkable that we have raised over $8,500 and none of it would have been possible without you. A message from Chad's mother, Melanie Reboul Huth: "Glenn and I would like to thank you all for your thoughts, prayers, and generous donations for our amazing son. He is truly loved and missed by so many." We have reached our primary goal! Thank you to everyone for the love, support and sacrifice. Every donation, whether it was $20 or $200 helped us get there! It is truly incredible and humbling to see the outpouring support of our friends, family and community. Rest in Peace Chad - we all miss you! Although we reached our daily goal, it is not over for us - the higher the fund's principal, the greater the scholarship payout. Thanks again to everyone - it makes a rough day like today truly bittersweet.